Made for hospitality people, by hospitality people. 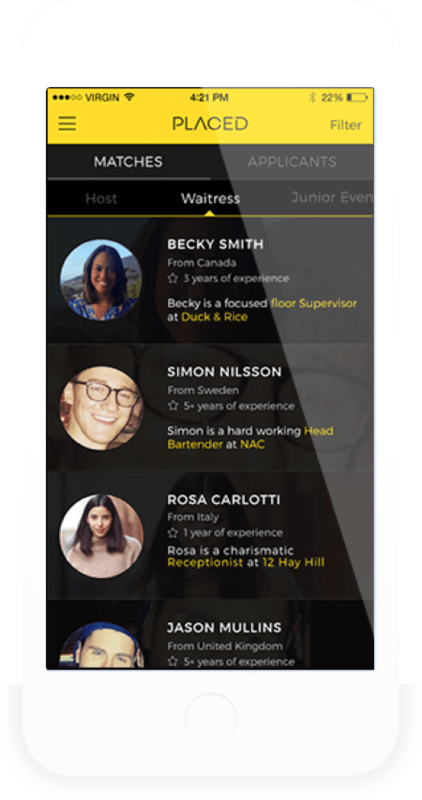 Placed uses smart technology to match quality jobseekers to the best roles in London. Sourcing the right staff is tough. Finding the right jobs ain’t easy either. Placed uses smart technology to smoothe out the entire process by matching the right places to the right people in the very first instance. We know how this generation of jobseekers want to find work. We’ve tailored our product to speak their language and guide them to the best jobs for who they are and what they’re looking for. Simply, we keep up with the jobseekers so that the venues can keep up with the demand. We’re hospitality people ourselves and Placed has been made for the restaurants, bars and hotels that make London so great. We’ve worked alongside the best in the industry to build something venues really need and what jobseekers really want. "These women know what it's really like to launch and grow a brand"
"This app is amazing, you've totally innovated the job hunt. Much appreciated"
A fine and funky mix of over 900 brands in London town!